As we enter May we leave behind our beautiful blooming azaleas but there are still surprises to be enjoyed each day. As I walked the garden today I came across Kalmia latifolia or Mountain-laurel. What a stunning show of blooms! 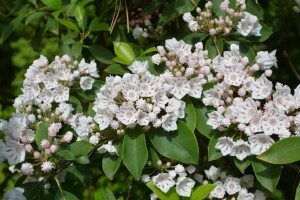 Mountain-laurel is a great companion to our azaleas as it enjoys the same growing conditions -sun to part shade with moist but well drained acidic soils. Mountain-laurel is a large evergreen shrub growing 7-15 ft. in height. Ours is placed as a single specimen plant where it has ample room to grow. There are several dwarf cultivars available. ‘Elf’ and ‘Minuet’ reach 3 ft.-4 ft. tall and wide. These smaller selections are perfect for the home landscape if you have limited space. If you are now growing azaleas consider adding a spot for Mountain-laurel in your garden. Amy’s New Favorite Azalea Cold weather got you down? Hellebores the cure!